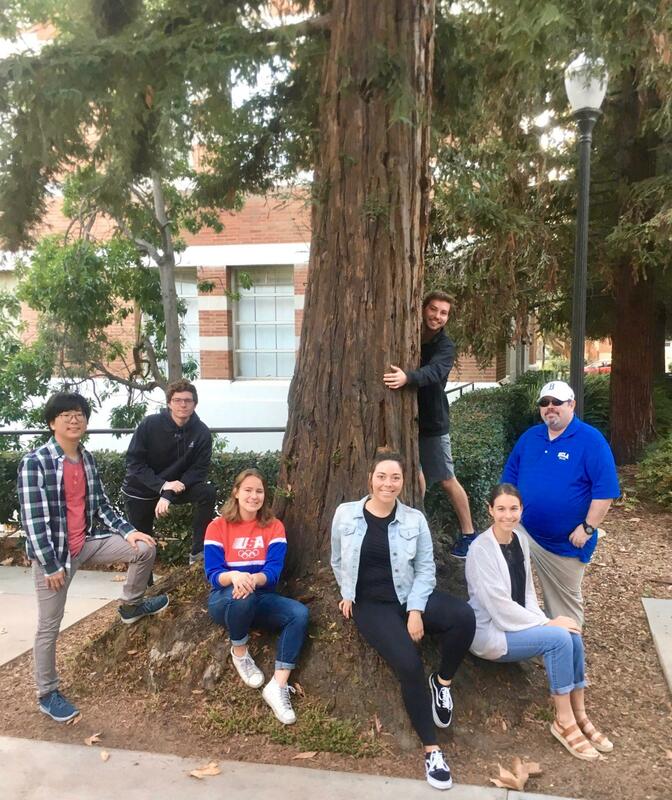 The 2018 Sustainability Action Research Native Landscaping team has a lot of ground to cover as they analyze ways to make UCLA’s campus more native plant friendly. See what the team has been up to during Spring Quarter 2018! Hogan explains his idea for our Earth Day Fair booth activities. The Native Landscaping booth will have a wheel of fortune featuring California native plants, and California poppy seeds will be given to winners! The team discusses our three-pronged plan for coming up with landscaping recommendations during Spring quarter. This comprises a native plant palette/map for UCLA, a case study on underutilized spaces, and reaching out to other campuses for advice. Week 2: First data collection day! During our stakeholder meeting this week, we were able to see all of the succulents that Bonny has for us to use for the Earth Day Fair. Our first data collection day! Hogan measuring the area of an under-utilized grassy space near Kerckhoff patio with the measuring wheel. UCLA SAR Native Landscape team (with assistance from Grad Housing project) participated in the Earth Day fair at Dickinson court with a fun and educational spinner trivia about native plants with winners getting native poppy seed bombs and seed packets. The UCLA SAR Native Landscape team booth at Earth Day drew a sizable crowd all day and helped educate fair attendees on the importance and diversity of native plants and their benefits to the ecology of the campus, as well as in reduced maintenance and water costs. Week 4: Assessing the native landscaping on campus. The SAR native landscaping team checking out the native and drought tolerant plants near the engineering 6 building! A student walks past a wall covered in invasive ivy, that while it makes a great decoration, can spread quickly and strangle other plants out of a viable habitat; it also takes a lot of manpower to keep it at bay! The Native Landscaping team sits under a solar umbrella to charge their devices as they discuss the team’s plans for Week 6 and the rest of the quarter! The Native Landscaping team working hard to put together their final product! The team discusses the cost of maintaining landscapes of various locations on campus in a meeting with Chris Gallego and Raul of Landscaping and Grounds at Facilities Management. Raul gave us a tour of the storage where landscaping equipment and vehicles are stored. We learned that native and drought-tolerant plants not only minimize water usage, but also reduce the labor costs and health risks associated with maintaining the landscapes on campus.